The often untraveled landscapes of the nearly 450 military installations in the continental United States contain some of the most pristine wilderness experiences in the country and are often better managed than many federally designated wilderness areas, according to one of Nevada's top ecologists. In a new book, Military Geosciences in the Twenty-First Century, published as part of the GSA's (Geological Society of America) Reviews in Engineering Geology series, Mary Cablk, Ph.D authors a chapter that challenges the traditional definition of wilderness and draws on examples from the United States and abroad to pose the question - "Does wilderness exist on military installations?" Intended to spark discussion, and not supported by grant monies or research sponsors, Cablk contrasts the social and environmental costs of allowing open access to the 109.4 million acres of designated wilderness in the United States, with the unique and unexpected landscapes that exist within the 30.2 million acres of federally managed military lands. "Although wilderness is legally defined (in the Wilderness Act of 1964), having a wilderness experience can occur anywhere. Even for, and especially on, militarized lands," explains Cablk, who has spent a lifetime on military bases in the U.S., first through adolescence and later as associate research professor at Nevada's Desert Research Institute (DRI) studying the Earth's varied landscapes and military applications and resource management on federal lands. "Most of the actual language in the Wilderness Act of 1964 describes what wilderness is not, rather than what it is. It is by definition, a work in contrast," she adds. 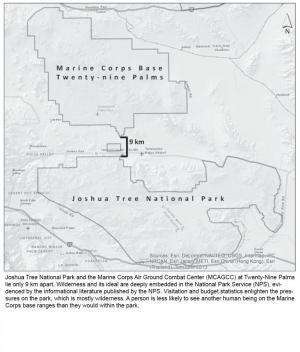 Cablk offers the example of Joshua Tree National Park in California, which sees more than 1.4 million visitors per year, with the neighboring Marine Corps Air Ground Combat Center at Twenty-Nine Palms, a mere nine-kilometers north of Joshua Tree and host to only 68,000 troops trained annually. Each contain some of southern California's most isolated and pristine landscapes. Her argument illustrates the various impacts of human activity on these public lands in the Mojave Desert and their management agency's vastly different approaches to tourism, preservation and public access. The National Park Service (NPS) is faced with providing unlimited access to Joshua Tree NP alongside careful stewardship - all while tackling waning agency budgets, Calbk explains in the book. 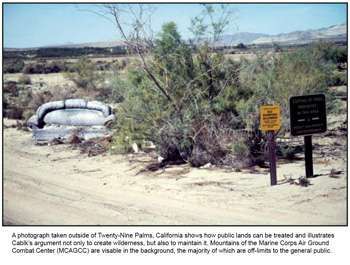 Whereas, Twenty-Nine Palms offers little to no public access and is managed by a federal agency with nearly 50 times the NPS annual budget allocation from Congress for the "protection of irreplaceable resources, its lands, and the plants and animals therein." "Biodiversity and nature can and do exist in unexpected places," Cablk states. "Surprisingly, the opportunity for a wilderness experience may be preserved in the unexpected landscapes of military installations, limited of course by accessibility." Calbk goes on to explain that even the congressional act designed to protect federal wilderness areas does not provide guidance for how preserving and sustaining such places shall be funded. "There is no means to budget for that which is intangible... How does one place value on experience or rank performance goals toward accomplishing such." Cablk states. "Section 2 (b) of the Wilderness Act of 1964 states, "...No appropriation shall be available for the payment of expenses or salaries for the administration of ... Wilderness... nor shall any appropriations be available for additional personal... for wilderness...""
In stark contrast, the Department of Defense Legacy Resource Management Program, passed by Congress in 1990 as a means to address conservation of natural and cultural heritage while supporting military readiness, funds "protection of irreplaceable resources, its lands, and the plants and animals therein." While the book chapter doesn't call for the U.S. Department of Defense (DOD) to tear down fences and open access to its land, Cablk does provoke the idea that military landscapes can share the same issues of access and human impact as federally designated wilderness areas and that the two are not as different as they may seem from an often uninformed, outside perspective. "Consider this to be a starting point," writes Cablk, "for future exploration and the opportunity to challenge personal beliefs." 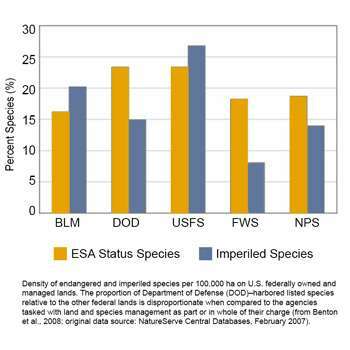 The report also notes that the DOD now harbors more rare, threatened, and endangered species on its lands than any other landowner in the United States, thus by Cablk's definition defaulting the complex federal agency into the role of capstone steward of America's biodiversity. From my limited experience as a Marine in the 60s and as construction superintendent in the 70s,80s,90s and early 2000s the military is an excellent example of how to manage environmentally sensitive lands. The rules are strict and enforced and based on the the best available science. I know it seems counter intuitive to someone who has never served or who served but didn't have an opportunity to see the big picture but within the Pentagon brass are some highly educated brass thinking long term. The Pentagon realizes the reality of climate change and is planning accordingly.